There was a time in the development of the fire monitoring industry that digital voice access control systems (DVACS) technology, consisting of communication lines that offered a supervised data connection to customers’ properties, was industry leading in terms of its security. But, as with any piece of technology, DVACS is now considered outdated, with new technology in the industry which meets the ULC-S561 standard.. Fire alarm and fire sprinkler monitoring through cellular can fit the need of your building for secure, code compliant fire monitoring. 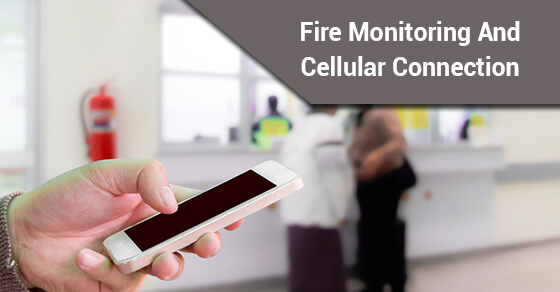 There are a number of reasons why cellular fire alarm monitoring would be a great option for your property, so read on to learn about what you need to know about fire monitoring and cellular connections. Again, DVACS technology used to be the go-to standard. All that customers had to do was have a telecommunications company install a F1/F2 subset, and then the monitoring service provider would come by and install their own connections, connect to the subset and activate monitoring. But DVACS technology has pretty much been phased out as manufacturers ceased making equipment which works with it.. Cellular alarm monitoring has been around for a long time and is a proven method for the monitoring of fire alarm and sprinkler systems. While DVACs was convenient from a customer’s point of view, in that there was never any intervention required on their end to get monitoring working, cellular alarm monitoring systems can be cheaper and more flexible. With passive alarm monitoring, existing forms of communication like fax lines and internet connections can be used in conjunction with the cellular connection to provide code compliant ULC-S561 “passive” level fire alarm monitoring, at a significant reduction in cost compared with DVACS. These systems can be built to fit the unique nature of your facility. Even considering the above, cellular fire alarm monitoring doesn’t necessarily require a second form of communication.. By offering a supervised cellular connection (also known as “active” cellular fire alarm monitoring) to your property, there won’t be any need for a secondary form of communication such as a phone line or an Internet connection. These systems are supervised in the same way as a DVACS system, providing a “true” replacement for DVACS. Furthermore, the fire monitoring provider (like FMC)will shoulder the responsibility of installation, including the management of the cellular service.While this service is more expensive than “passive” fire alarm monitoring, it is still less than DVACS and you’ll end up saving since the cost of active fire alarm monitoring is lower than if you had to foot the bill to get a new phone line or Internet connection. Active or Supervised cellular fire alarm monitoring is a great solution on sites where there may never have been phone lines or where phone lines should not be shared. Indeed, the right ULC fire alarm monitoring solution will help you to protect your property. ULC-S561 monitoring with cellular will give you robust communications no matter what services you have on site..